It's pretty disappointing how just about any reboot or remake these days is almost automatically met with negative feedback on the internet mainly because it's different from what had come before. And to be fair, I was pretty skeptical of reboots as well when they first started coming out more frequently. but the fact that there are quite a number of great ones out there just tells you it's not all bad. A reboot can do a lot to refresh an older franchise in the same way that we accept when a comic book character comes back from the dead or has their history reset as part of a major crossover event. So when I saw the first looks for She-Ra and the Princesses of Power, I was actually pretty excited because I was liking the new spin on the character's look and feel and the overall tone of the show had a lot of potential. And things were even better than I had imagined once we actually started watching the show and got to experience the unique story that they had prepared for this show. 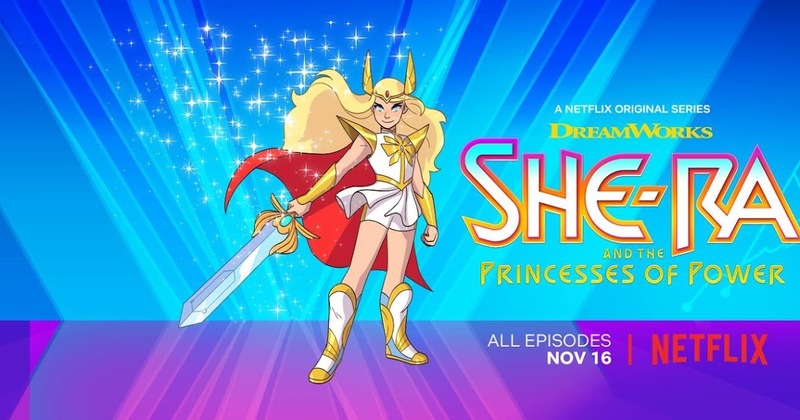 Synopsis: She-Ra and the Princesses of Power is an American animated television series developed by Noelle Stevenson and produced by DreamWorks Animation Television for Netflix. The first season consists of 13 episodes each about 24 minutes long. Adora (Aimee Carrero) is another of those training as a member of the Horde together with fellow recruits like Catra (AJ Michalka). Adora had been pretty much raised by Shadow Weaver (Lorraine Toussaint) given she was an orphan when the Horde found her and is well on her way to becoming the next Force Captain for Hordak's forces. But one day she gets lost in the woods and encounters a magical sword that has the power to turn her into the mighty magical warrior She-Ra. And once her eyes are opened to the horrors that the Horde have inflicted on the land, she decides to join the resistance together with Glimmer (Karen Fukuhara) and Bow (Marcus Scribner) and they endeavor to bring back the Princess Alliance to defeat the Horde. What I Liked: The overall tone of the show is nicely uplifting as you have Adora trying to make up for being part of the Horde while figuring out how this She-Ra business is supposed to work and still trying to maintain her friendship with Catra at times? There is a heck of a lot going on and the show does a lot to help balance things as best as they can while keeping the overall narrative moving forward. And I liked how they really painted the characters in this show with the full palette, in a manner of speaking. And this is more than just about their character designs but even how the bad guys aren't quite fully bad guys yet and even the good guys have their flaws. It makes for very well-rounded characters and a lot of potential for great stories indeed. And they made good use of these elements in presenting a pretty good narrative by the end of the season. What Could Have Been Better: The series does start off a little weird given how quickly Adora leaves the Horde and then how the show has to go through a very shallow Princess of the Week format initially. I understand its value but really it gave the show a bit of a slow start that didn't quite help me get into the show sooner rather than later. But it does get better once you get over that initial hump. It doesn't help that the animation has a rather flat or dull feel to it at times that make some episodes feel rather rushed or of lesser quality. The show does have a lot of familiar beats when you think about similar shows that have tried to do a lot for diversity and representation like Steven Universe or the Avatar cartoons but more of this is never a bad thing. I appreciate how they made sure that their princesses are also of different races and gave more of a narrative as to a larger purpose to their powers. But it doesn't exactly handle its diversity thrust in an exceptional or memorable way, which can make it feel a little middle of the road in this regard. TL;DR: She-Ra and the Princesses of Power is a great fresh take on a classic story with very modern story sensibilities. The resulting narrative is a lot richer in that regard and provides for stronger character interactions and related story arcs. Thus the show gets a strong 4 times that Entrapta (Christine Woods) ends up being such a delight out of a possible 5 for this first season.